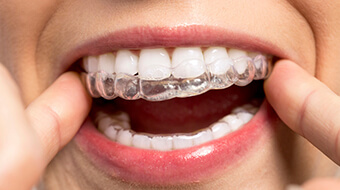 If you’re interested in getting a straighter smile but you aren’t interested in traditional bracket and wire braces, alignment tray orthodontics from Pelican Landing Dental may be just what you’re looking for. We offer two popular alignment tray orthodontic systems in Bonita Springs, FL practice: Invisalign and Smart Moves. If you’d like to find out more about cosmetic orthodontic solutions, contact our team to schedule a consultation today. We’ll discuss your options and help you make the best selection to improve your smile. One of the most popular orthodontic solutions available, Invisalign, uses a series of clear, plastic aligners to gently move teeth into their ideal alignment over the course of about twelve months of treatment. Unlike traditional bracket and wire braces that could require years of treatment and frequent orthodontic visits, the Invisalign orthodontic system can typically shift teeth into their ideal alignment while being virtually invisible and completely removable. Each set of aligners represents one step closer to the ideal smile alignment. You’ll wear the alignment trays for about one to two weeks at a time. Then, you’ll switch to the next set of aligners in the series. Every six to ten weeks, you’ll visit our office to ensure your teeth are progressing as planned. There’s no need to make changes to your oral hygiene routine or diet while undergoing Invisalign treatment. Instead, simply remove the aligners during meals and while you brush and floss your teeth. Then, replace them afterward. Like Invisalign, Smart Moves is a clear alignment tray orthodontic solution. The difference between the two systems is that Smart Moves focuses on simple movement of front teeth for a lesser price than comprehensive orthodontics. Rather than sets in a series, the Smart Moves system is based on setups. Each setup has two sets of alignment trays. The first is a softer material that gently begins moving your smile. After wearing the first set of aligners for about two weeks, you’ll wear a harder set of trays for two weeks. Most patients are able to complete minor tooth movements with just three smile setups.